Rich, redolent, savory – this Chicken Biryani, together with its gripping fragrance and slightly pungent flavor, is an Indian rice dish that will make you grab varieties of it. Chicken Biryani is a famous aromatic Indian dish fitting for namely either family times, buffets or party food platters. Originated in Persia, Chicken Biryani then, soon enough, spread its way further to the South of India. After traveling through different parts of India, the dish then appeared under many forms and versions, which varied from royal courts to local tables. Its ingredients were also modified bit by bit, and different methods were adapted to suit each indigenous dieting custom. The original form of Chicken Biryani is well-known by the name “Dam Pukht” which means “steam-cooked”. This has pretty much represented the cooking method for Chicken Biryani, which involves marinating the chicken meat and cooking it with basmati rice followed by layering. Kachi yakhni biryani chicken: The raw chicken meat is marinated with the spice blend first, then put to cook along with the rice so that both will come out well-cooked together. Pakki yakhni biryani chicken: Both the chicken meat and the rice are cooked ahead separately, then layered over one another in a dutch oven and steamed in a shorter period of cooking time. So basically we did follow the first method here, just with a minor manipulation: we gave the chicken a quick sear before bringing it to a boil with the rice. That was plainly supposed to tenderize the chicken and make it more juicy. For the fact that Chicken Biryani involves only chicken thighs and fresh ground spices, then yes, it is healthy. Though higher in calories and fat when compared to chicken breasts, thighs are still a good source of lean protein. If you wish to follow strictly on your daily quota, simply watch for the portion size. The differences in nutritious contents may not vary vastly between the two, but the numbers can still add up quite much in larger servings. Honestly speaking, any chicken parts would do well just the same, so, the decision is yours. Also, consider purchasing fresh whole spices then ground it yourself so the taste could be as close to its original taste as possible. Additionally, basmati rice, a popular long grain rice coming from the South Asia, is also a big plus for healthy eating. If you’re obsessed with the fact that carbs intake will make you gain more weight, basmati rice is an even greater choice for you. It is composed of complex carbs, with a much lower glycemic index (58) in comparison with that of regular white rice (109), which means less feeling bloated, much more filling and easier digestion. Basmati rice can also reduce heart health risks, prevent cancer cell formation and lower diabetic risks. Perfect for those who are on diet or facing health issues. Don’t you fret over the long list of spices just yet. The spices are meant to culminate the maximum flavor for the dish. They also demonstrate the beauty of culinary art by creating the royal but casual atmosphere when caramelized through layers of chicken and rice, one by one. Back in the old days, coconut-infused curry paste and ginger garlic paste were peculiarly favored in the South of India, and Chicken Biryani was not an exception either. Rice and chicken were mixed but not layered. 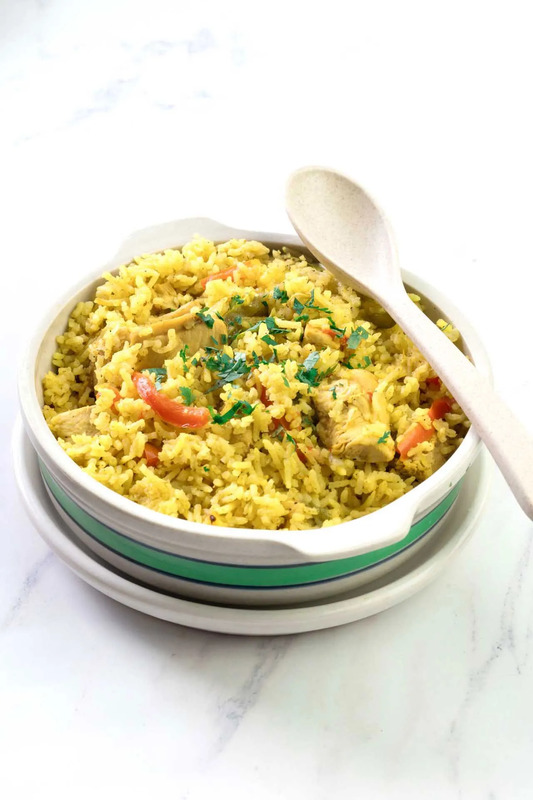 Only after having travelled through continents and cuisines, the most famous adaptation for Chicken Biryani now in America is the recipe that calls for layering, either with or without curry paste depending on the cook’s preference. This Chicken Biryani is truly a staple to indulge in. For people following gluten-free diets, you can consider using organic, free-range chicken broth instead. There is even a low-sodium version in case you want so. Add the chicken thighs in a giant bowl, pour in the ingredients listed above and marinade. Let them sit for a minute. Discard excess marinade from the chicken thighs, place them skin side up over medium-high heat on skillet/pan. Cook the chicken on 1 1/2 tablespoons of olive oil for each side until they get slightly charred (about 3 minutes). Remove them and set aside. Remove excess burn from the pan (if any) and continue to add in the chopped onions, bay leaf, 1 tablespoon minced garlic, chopped red bell pepper and green bell pepper. Sauté until the onions turn soft and translucent (2-3 minutes), then add in all the ingredients for the spice mix listed above and keep stirring for 1 more minute. Pour the chicken broth to the pan and bring to a boil. Return the chicken back to the pan and let simmer for another 3 minutes. After done, turn off the heat but leave it covered for an extra 5 minutes. Separate the broth from the chicken. Divide the basmati rice into 2 equal portions, mix one with the broth, then combine the two together once again. Bring the chicken out to serve with the rice. Chicken Biryani is often served with a hot bowl of steamed basmati rice; other than that, a naan or cooling Indian Raita are great options too. You can also make it a bit lighter with a tinge of lime.